James McKemey, our Head of Insights, takes a deeper look into the types of air pollution in the UK. Air pollution is big news. And with good reason. We’re now used to concerning statistics and stories like the 40,000 air quality related premature deaths per year in the UK and news that children are exposed to 30% higher pollution doses. Although rapid progress is being made in some environmental sectors such as the decarbonisation of power, air quality, particularly in urban centres like London, continues to remain above safe levels. We need to tackle this problem. So, what is the cause of urban air pollution? 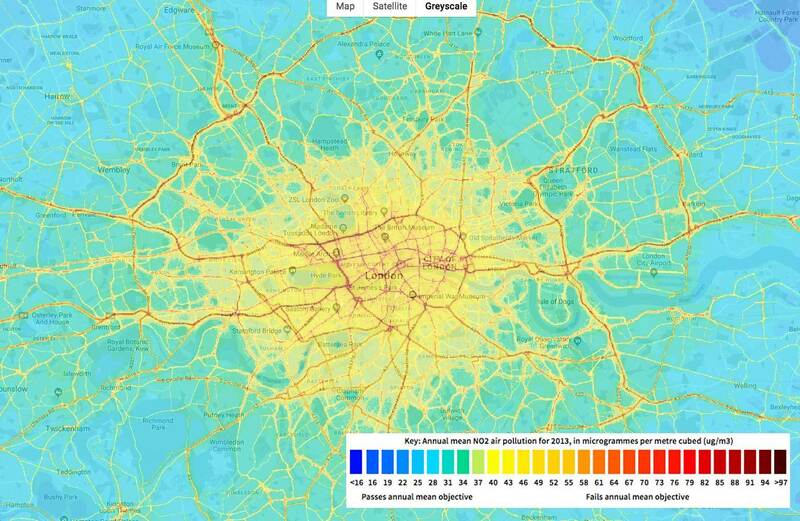 Well, there’s a clue where the primary air pollution sources are from air quality mapping, for example, this “London Air” map of NO2 pollution in London. I have seen some question whether road transport is really the primary source of these concentrations of pollutants, but the alignment of the red (worst) areas and the main road network is beyond coincidental, while the stats continue to name road transport as the primary source of urban air pollutants. So, what are the common air pollutants? London Air keeps tabs on 4 air pollutants that are known to be harmful to health and can be mapped. Nitrogen Dioxide (NO2) 50% of all NO2 pollution comes from road vehicle exhausts and the highest concentrations are found near busy roads. Inflames the lining of the lung and reduces immunity to lung infections such as bronchitis. Effects aggravated in asthma sufferers. Ozone (O3) Ozone is typically produced by a reaction of NO2 with sunlight. Can irritate and inflame lungs, irritate the eyes, nose and throat, which can lead to cough and chest discomfort. Can exacerbate existing respiratory conditions. Particulate Matter <10μm (PM10) Dust and soot from engines, small bits of metal and rubber from engine wear/braking as well as dust from road surfaces. Particles smaller than about 10 micrometers, referred to as PM10, can settle in the airway and deep in the lungs and cause health problems, e.g. worsening of heart and lung disease. Other harmful air pollutant exhaust gases including Carbon Monoxide (CO), Sulphur Dioxide (SO2) and other oxides of Nitrogen (NOx) - these are all harmful to health, but their emittance is less routine which makes them harder to predict and map. NB: Carbon Dioxide (CO2), though a greenhouse gas and major contributor to climate change, is generally not considered a contributor to air pollution as it is harmless to human health unless in extraordinarily high concentrations. So, how do EVs help? Well having no exhaust means no exhaust gases or soot at the point of use. While it is true that we are still reliant on forms of generation that have air quality impacts (particularly coal and to an extent gas), they are sited away from densely populated areas and treated heavily to mitigate air quality impacts. So, to an extent, EVs completely solve combustion based air pollutants in urban areas. Hooray! Particulate is a bit different. No combustion soot, no clutch or engine ware, but EVs still have brakes and our wheels still disturb the road surface. That said, ask any EV driver and they will tell you-you hardly touch your brakes compared to driving an ICE car as most of the deceleration is performed by regenerative braking. Hopefully removing harmful gases and reducing sources of particulate will have transformative effects that all but solve the air pollution problem. But if after all that progress the particulate from tyre and road ware is found to still cause material air quality concerns (and that is a lot of progress, so it’s a big if), then we have just two areas to seek new, innovative, less polluting materials - tyres and road surfaces.